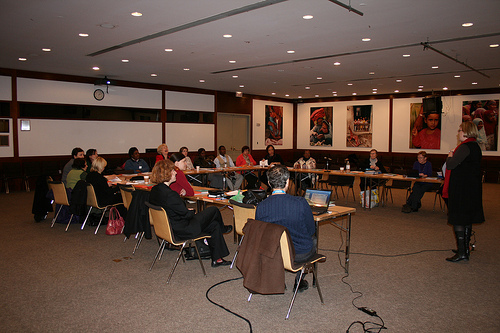 World YWCA delegates met together in a conference room at the UNICEF building for the first time as an entire group on February 26, 2010. During this orientation we were able to learn more about each other, grow as a team, and gain knowledge that will help each of us have a meaningful CSW experience. As a group we also discussed our individual expectations as well. Susan also gave a brief but comprehensive overview of the United Nations structure, how the Commission on the Status of Women (CSW) fits into that structure, details about the Beijing Platform for Action (BPFA), and what to expect from this year’s CSW. Nyaradzayi Gumbonzvanda, World YWCA General Secretary, took on the task of helping the group understand our talking points and ways to best approach difficult or sensitive subjects that may come up in our conversations with others. To finish up the orientation Bonnie Fatio-Pollock, World YWCA volunteer, lead the group in a discussion about best practices for getting our message across effectively and in only a couple of minutes! In small groups members of the delegation had the opportunity to come up with and present one minute “elevator speeches” for each of the six recommendations the World YWCA has for the UN CSW (invest in women and girls, ensure safety and security of women and girls, involve women most affected, expand access to comprehensive services, promote women’s leadership, and keep promises made). Overall it was an exciting and informative start to CSW 54!